Give the Gift of Heggy's! Now you can purchase Heggy's Gift Cards Online! It's a great gift idea or a wonderful way to say thank you to someone special! 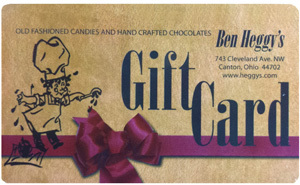 Please Note: Gift cards are only good on phone orders and in-store purchases (Cleveland Ave. Factory Store Only).